Experience Janis! 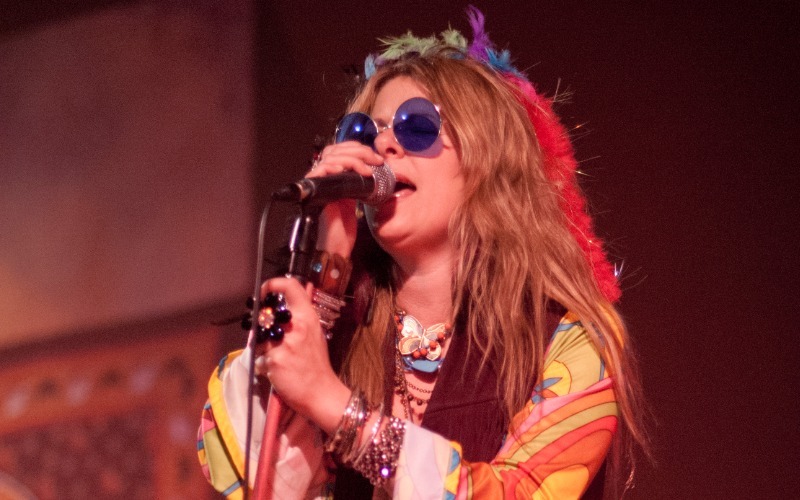 With a twinkle in her eye and that rasp in her voice, CC Coletti channels the spirit of Janis Joplin, belting out hit after hit in a heartfelt tribute performance. Her band of seasoned pros recreates the sound that defined a generation, slamming through classic 60s jams, laying down the soul, and conveying the tender ballads and old timey blues numbers that made Joplin a legend. CC and her band steam through the Janis catalog, peppering their hit-filled sets with some of Janis’ best deep cuts. Sights and sounds complement each other, as the stage is time-warped back to the psychedelic 60s, with tie-dye, lava lamps, and choice threads. A psychedelic visual show sets the backdrop for the band’s vintage gear, which provides an authentic sound as CC pays homage to her idol in the best way she knows how — urgently preaching the gospel according to Janis. CC, the show’s jewel and pearl, has a flourishing career of her own, including a string of successful solo recordings and 8 years on the road as part of rock icon Meat Loaf’s Neverland Express world tours from 2003 through 2011. She appeared on three of his DVD’s. Bat Out Of Hell Live With Melbourne Symphony, Three Bats Live and a documentary, In Search of Paradise. CC’s voice can be heard on Meat Loaf’s Bat Out of Hell 3 album and Hang Cool Teddy Bear. CC was also featured as the opening act for Meat Loaf’s European tour in 2007. All the while, she never forgot her early musical inspiration and knew it was inevitable that she’d pay tribute to her childhood idol. Tune in, turn on, and take a trip back to the Woodstock generation with Experience Janis! at a venue near you.